Ingredients Dough: 1 package active dry yeast 1 cup (250 ml) Lactantia® PūrFiltre 2% Milk, warmed (110 – 115°F/43 – 45°C) 4 cups (1 L) all-purpose flour 1/2 cup (125 ml) granulated sugar 1/3 cup (75 ml) Lactantia® European Style Butter, Unsalted, softened 2 eggs 1 tsp (5 ml) pure vanilla extract Filling: 3/4 cup (175 ml) packed brown sugar 3/4 cup (175 ml) Lactantia® European Style Butter, Unsalted, softened 3 tbsp (45 ml) ground cinnamon 1 tbsp (15 ml) pure vanilla extract 2 cups (500 ml) fresh blueberries Glaze: 6 tbsp (90 ml) Lactantia® European Style Butter, Unsalted, melted 1 cup (250 ml) icing sugar 1 tsp (10 ml) pure vanilla extract 1 tbsp (15 ml) Lactantia® PūrFiltre 2% Milk (optional) Instructions Dough: In a room temperature bowl, whisk yeast and warmed Lactantia® PūrFiltre milk together to dissolve. 1 In a mixing bowl fitted with a paddle attachment, combine flour, granulated sugar, Lactantia® European Style butter, eggs, and vanilla; mix well. Pour the yeast mixture into the bowl and attach the dough hook. Mix until it is well incorporated and the dough is pulling away from the sides of the bowl to form a ball. Place the dough in a large greased bowl. Cover with a damp linen tea towel. Let it rise in a warm place for 1 hour or until doubled in size. Filling: In a medium bowl, combine brown sugar, Lactantia® European Style butter, cinnamon and vanilla, until smooth; set aside. Punch down dough. Turn out onto well-floured surface; roll out into 18- x 14-inch (45 x 35 cm) rectangle, making sure thickness is even throughout. 1 Spread filling mixture evenly, leaving a 1-inch (2.5 cm) border uncovered on the long top side farthest from you (this will be where the roll closes). Sprinkle evenly with blueberries, pressing lightly into the butter. Carefully roll bottom long edge away from you until you have a log. With a sharp knife, cut across into 12 pieces. Place cut sides down in well buttered 13 x 9inch (3 L) glass baking dish, with 3 pieces per row. Cover with damp tea towel and let rise for 30 minutes or until doubled. Preheat oven to 350°F (180°C). Bake for 40 to 45 minutes or until golden brown. Glaze: Meanwhile, in small bowl, whisk together Lactantia® European Style butter, icing sugar and vanilla. If using, add 1 tbsp (15 ml) of Lactantia® PūrFiltre milk or more to desired consistency. When rolls are done, drizzle with glaze. Serve and enjoy. In a room temperature bowl, whisk yeast and warmed Lactantia® PūrFiltre milk together to dissolve. 1	In a mixing bowl fitted with a paddle attachment, combine flour, granulated sugar, Lactantia® European Style butter, eggs, and vanilla; mix well. Pour the yeast mixture into the bowl and attach the dough hook. Mix until it is well incorporated and the dough is pulling away from the sides of the bowl to form a ball. Place the dough in a large greased bowl. Cover with a damp linen tea towel. Let it rise in a warm place for 1 hour or until doubled in size. In a medium bowl, combine brown sugar, Lactantia® European Style butter, cinnamon and vanilla, until smooth; set aside. Punch down dough. Turn out onto well-floured surface; roll out into 18- x 14-inch (45 x 35 cm) rectangle, making sure thickness is even throughout. 1	Spread filling mixture evenly, leaving a 1-inch (2.5 cm) border uncovered on the long top side farthest from you (this will be where the roll closes). Sprinkle evenly with blueberries, pressing lightly into the butter. Carefully roll bottom long edge away from you until you have a log. With a sharp knife, cut across into 12 pieces. Place cut sides down in well buttered 13 x 9inch (3 L) glass baking dish, with 3 pieces per row. Cover with damp tea towel and let rise for 30 minutes or until doubled. Bake for 40 to 45 minutes or until golden brown. Meanwhile, in small bowl, whisk together Lactantia® European Style butter, icing sugar and vanilla. If using, add 1 tbsp (15 ml) of Lactantia® PūrFiltre milk or more to desired consistency. 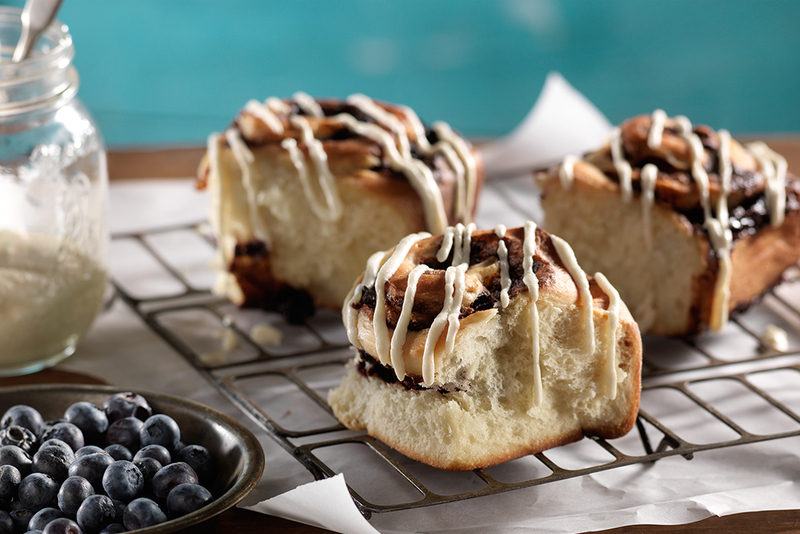 When rolls are done, drizzle with glaze. Serve and enjoy. Trusted since 1947, Lactantia® Butter has earned the reputation for being the finest-quality butter with a smooth, rich, and creamy taste. Lactantia® Butter is made with 100% pure cultured cream. Canada’s number one brand of butter is available in many varieties to suit your taste and lifestyle. Distinctive European cultured flavour churned to a higher fat to deliver a creamier and richer flavour. Perfect for baked goods and pastries or in sauces to enhance the flavour in any meal.